Birds. What the heck is up with birds? I realize that our nation’s symbol is the majestic bald eagle and such, but I’m not okay with them. (also let’s not forget our nations bird was almost a turkey…so that’s weird) Sure, birds look awesome soaring through the sky. They’re so beautiful and graceful. Yada yada yada. No. They’re creepy and disgusting and I don’t care for them. What’s that about? How do they do that? I’ve flapped my arms really hard at times, and have never taken off into the air to soar amongst the clouds. Not even once. I even tried it while wearing extremely large sleeves so as to catch air beneath them and still nothing*. I can’t fly. Birds should not be able to do things I cannot do. Sometimes they even fly into windows. That’s just plain stupidity. Dumb birds. Birds have this fantastic ability to fly, and yet I see them walking all over the place. Why would they do that? If I could fly, I would not be walking anywhere ever. What are they trying to do with that? Are they trying to show off to the other birds? “Oh hey look at me, I’m walking and your stuck up there flying! Ha ha.” Um not impressed birds. I can walk. More impressive when you fly. Morons. I’ve seen Jurassic Park. I don’t want dinosaurs roaming this earth. That t-rex ate Newman right off the toilet. Just ate him right up. I’m not okay with living my life trying to keep from being eaten as I use the restroom. Get out of here, dinosaur-birds. One time at the zoo a tiny little chicken walked out of a bush at me. And I mean AT me. That thing was out for blood. Why did that tiny chicken do that to me? Well because he was a bird. And birds are terrible. Also they’re always flying in front of my car like they want to die. With me being the kind animal lover that I am, I do my best to avoid hitting them. And then what do these birds do? They fly out of the way as I’m swerving to my death trying to keep from killing them. They’re trying to cause me to crash and I know it. Why are they always popping out at me? I will never purchase a cuckoo clock. Never. After I save their lives and don’t run them over in my car…they thank me by pooping right in the middle of my windshield. Stupid, stupid birds. Bird flu? Ever heard of it? I have, and I don’t want it. I don’t want a disease from a bird. “How did Amanda die again? Oh she touched a bird and got the flu. What a terrible way to go.” I’m not letting a bird take me down. Not now, not ever. Go ahead and try to convince me that there are good qualities about birds. I’m not buying it. Birds are the worst. 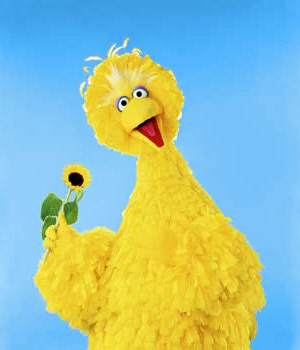 And that’s why I will never visit Sesame Street, where the biggest bird of all lives. Can you imagine the mess he’d make on my windshield?? *Not a true story. I might try it tomorrow though. Hollywood, Leave the Monkeys Alone! Growing up some of the best movies that I watched involved misfit kids who overcame adversity. Movies like The Sandlot, The Mighty Ducks, The Big Green. Those are classics. Those misfits came together, solved a problem, became good at sports, and even won championships. Small children everywhere become inspired and immediately joined a sports team in hopes of being on a championship team. I was not the child inspired by those sports movies. I was inspired by monkey movies. It came to my attention recently that children today are not receiving the joy of monkey movies that I had growing up. I haven’t seen a Monkey in human clothes playing sports in years. I might even say that Hollywood is doing a disservice to children and monkeys in general. The monkey movies of today are giving monkeys a bad reputation. Outbreak, a monkey is responsible for the spread of an incredibly contagious disease that kills thousands of people. Rise of Planet the of the Apes, the monkey gets out of control, reeks havoc everywhere, and even bites a man’s finger off. WHAT ARE WE DOING TO THE MONKEYS?? Monkeys are cute and possess human qualities. They play baseball with Matt Leblanc, go to space with Harland Williams and befriend a young boy in a hotel. THEY DON’T SPREAD DISEASE OR BITE PEOPLE’S FINGERS OFF! (there’s a chance that these things could happen, but I choose to remain ignorant) How will this generation of children find the love and joy of monkeys in human clothes if they are scared for their lives? This will never work. We need a new monkey movie. And that is why I have come up with this simple movie plot that I’m taking to Hollywood. It will bring monkey joy to thousand of children around the world and they will no longer fear for their phalanges. The setting, New York City, the summer of 2012. A life-hardened businessman, Stanley, is looking for joy in his life. His family has left him because he puts his job first. In walks Chachi, the happy chimp who has recently escaped from the Bronx Zoo. Stanley thinks he’s losing his mind because he keeps seeing this chimp everywhere. Finally he comes to acceptance of the realness of Chachi and decides to take care of him and make him his friend because he has no others as he has alienated all of his real friends. He dresses him in business suits and slowly falls in love with Chachi. Through a series of hilarious misunderstandings Stanley’s family finds out about Chachi. They see that Stanley has changed and is caring deeply for this chimp and he could love them again too. Stanley’s son, Adam, convinces his mother, Leslie, to give Stanley another chance. They fall back in love. The Bronx zoo takes Chachi back. Adam begs for his fathers help in getting Chachi back. Stanley finally caves and they form a coup to get Chachi back. The final scene of the movie is Stanley and Leslie renewing their vows while Chachi obviously acts as the minister. The love of a chimp brings about the renewal of love in a marriage. Classic chimp movie. Monkeys bring everyone together and make everything better. We don’t need children to be fearful of monkeys. We don’t. Children already have to be wary of strangers, they don’t need to worry about chimps also. If I could just get Hollywood to make this movie, I know I could bring back a happy perception of chimps. Let’s work together to get children to fall in love with monkeys again. 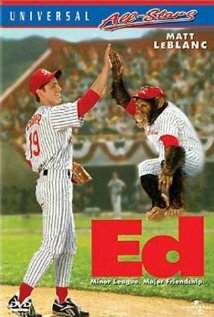 And let’s keep dressing chimps as baseball players because that’s just adorable. 6:30 a.m. : I’d like to get up now. Why is girl still sleeping? I will sniff her face….NOPE. She DID NOT like that. DOOR IS OPEN!! RUNNNN!!!!! 6:35 a.m. : Need to pee, need to pee, need to pee, need to pee….SMELLS LIKE SQUIRREL….FIND SQUIRREL, FIND SQUIRREL, FIND SQUIRREL….oh. need to pee, need to pee…this is nice spot to pe….SQUIRREL….CHASE SQUIRREL….SQUIRREL IN TREE. I will stare into tree until squirrel comes out……oh…need to pee…..peeing. TREAT. I GET TREAT. RUUUNNNNN!! 6:45 a.m. : I’d like to sleep now. GIRL CLOSED DOOR!!! HEY HEY HEY HEY!! OPEN THE DOOR!……..HEEEY. HEYHEYHEYHEYHEYHEYHEYHEY! DOOR OPEN!! HEYHEYHEYHEYHEY! OH! OPEN DOOR. RUUUUN!!! 8:45 a.m. : Aaaaah. Relaxing slumber. GIRL MOVED. MUST LICK FACE!!!! GIRL DID NOT LIKE THAT!! 9:15 a.m. : Girl is running? SHE WANT TO PLAY!! ATTACK!!! AAAH! Girl yelled at me? Sad! OOOOHHH TRASH!!! EAT THE TRASH!! Why did girl take trash away? MUST EAT GIRLS SOCKS LATER. 9:35 a.m. : Girl is in room with giant water dish. MUST GET IN THERE NOW. HEYHEYHEYHEYHEYHEYHEYHEYHEY!!! OPEN DOOR! RUUUUNN!!! TOILET PAPER ROLL!!!!!!!!!!!!!! EAT IT! OOOH. Clean clothes!!! MUST LAY ON THEM!!! 10:00 a.m. : Girl is eating yogurt!!! WANT TO LICK THE YOGURT!!!!! AAAAHHH!!!! LICK THE YOGURT!!! 10:15 a.m. : Girl left yogurt container!!! LICK IT NOW!!!!!! YUMYUMYUMYUM…UH OH. SPOON FELL IN FLOOR. RUUUUUNNNNN!!!!!! 11:00 a.m. : NEED TO PEE. RING BELL. LOOK AT GIRL. RING BELL. LOOK AT GIRL. RING BELL. LOOK AT GIRL. DOOR OPEN? RUUUUNNNN!!! Squirrel? Squirrel? Squirrel? SQUIRREL!! Follow smell. Follow smell. Follow smell. Follow smell. PEEE. Follow smell. TREAT??? RUUUUNNN!! 11:10 a.m. : I do not like this treat. I will leave it here. NOO!!! OTHER DOG TRIED TO EAT TREAT! GRAB TREAT. RUUUNN!! 11:45 a.m. :……………………………no squirrels. OOH GIRL HAS COMPUTER. MUST SIT ON GIRLS LAP. 11:58 a.m. : Other dog peed on girls bed. VINDICATION FOR KICKING THIS MORNING. MUST SNIFF PEE. I HEAR GIRL COMING!! RUUUUNNNNN OTHER DOG. 12:15 p.m. : Girl is eating lunch!!! MUST STARE AT GIRL!!! WHY ARE YOU NOT FEEDING ME GIRL???? MUST POOP SOMEWHERE IN GIRLS ROOM LATER. 2:47 p.m. : ……………..AAAH. CAR OUTSIDE. MUST BARK AT IT. 3:30 p.m. : ……..Throw it. Throw it. Throw it. RUUUUUUUUUNNNNNNNNN. HERE GIRL. SQUEAKY TOY…SQUIRREL!!!! STARE AT IT!!! HEY SQUIRREL! SQUIRREL! SQUIRREL. LOOK AT ME!!!! LOOK AT ME SQUIRREL!!!!! HEY SQUIRREL….DID I HEAR FOOD??? RUUUUUUUUN TO KITCHEN. 4:45 p.m. : GARAGE DOOR!!!!!!! RUUUUUN!!!!! JUMP ON HUMAN!!!!!!!!!! JUMP JUMP JUMP. GET AWAY OTHER DOG! GET OFF ME DOG. HEY GET OFF. JUMP JUMP JUMP…OH NEED TO PEE. Ring bell. Look at girl. Ring bell. Look at girl. Ring bell. Look at girl. DOOR IS OPEN. RUUUUUUUN. 4:50 p.m. : SQUIRREL. SQUIRREL. SQUIRREL. I’M OUTSIDE. SQUIRREL SQUIRREL SQUIRREL. WHERE ARE YOU??? oh. need to pee. need to pee. need to pee…..wait. need to poo. need to poo. need to poo. need to poo. POOPING! TREATS!!!! RUUNN!!!! 5:00 p.m. : Humans are eating??? MUST STARE!! HEYHEYHHEYHEYHEYHEY GIRL. HEY HEY HEY. CHICKEN!!!! yumyumyumyumyumyumyum heyheyheyheyheyheyhey girl more food!! heyheyhey BREAD. YUMYUMYUMYUM. HEYHEYHEYHEYHEYHEYHEY aaawwwww no more food? NAP TIME!!! 10:05 p.m. : need to pee. need to pee. need to pee. need to pee. need to pee. peeing. SQUIRREL????? SQUIRREL SQUIRREL SQUIRREL SQUIRREL. TREAT??? RUUUUUN! 10:15 p.m. : Bed time? OK. I WILL LAY IN THE MIDDLE OF THE BED. SO TIRED….goodnight girl. Enjoy your tiny corner of bed. 11:56-12:10 – Amanda and Wally drive to the veterinarian in Spring Hill. Numerous attempts on Wally’s part are made to enter into Amanda’s personal driving bubble. Amanda shoves Wally over and almost crashes multiple times. Wally stands up on door and makes the windows have drool/dog snot spots. 12:10 – Amanda and Wally arrive at the vet without either one of them dying. They enter the building at the same time as a fluffy puppy. 12:11 – Wally has homicidal thoughts towards the other dog. Amanda attempts to keep them from becoming a reality.Wally is not pleased and would like to bark. Amanda is ashamed. 12:20 – Man vet comes in and forces Amanda to place Wally on the metal table. Wally lays limp. 12:21 – Man shoots Wally three times. Wally is not pleased. 12:23 – Amanda and Wally are allowed to exit the room. 12: 24 – Amanda is told she has to pay an unreasonable amount of money for her dog’s health. Her eyes get sad. 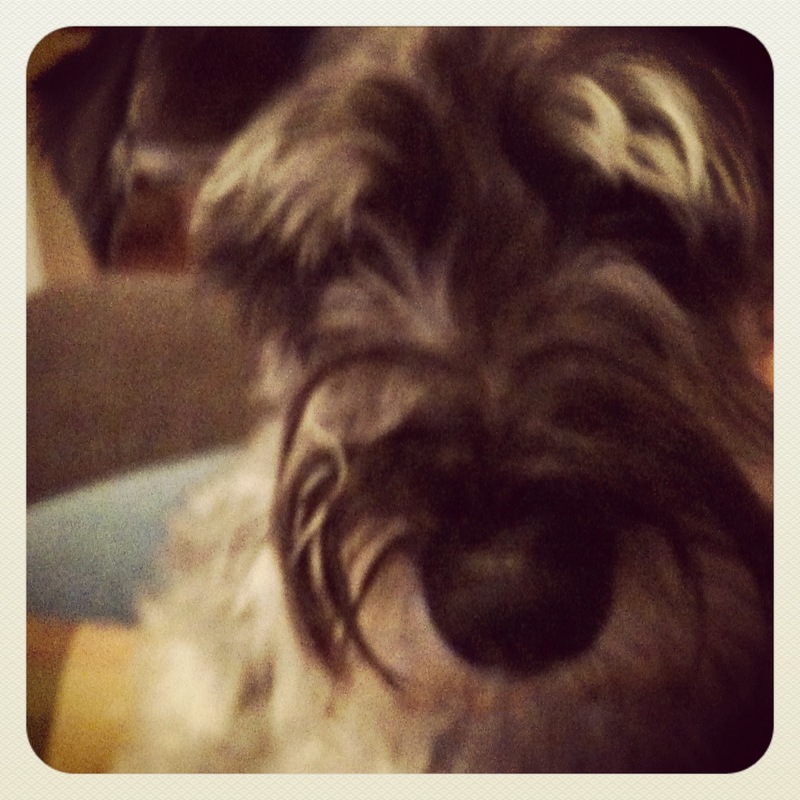 12:24 ½ – Wally escapes from his collar. Amanda apprehends the escapee before more damage is done. 12:24 ¾ – Amanda finally pays the unreasonable amount of money and get her receipt. 12:25 – Amanda and Wally exit the building as fast as humanly possible. 12:26 – Wally and Amanda get in the car using the same door to prevent more mud in other places of car. 12:26-12:32 – Amanda and Wally begin their (what seems like) long long journey back to Olathe. 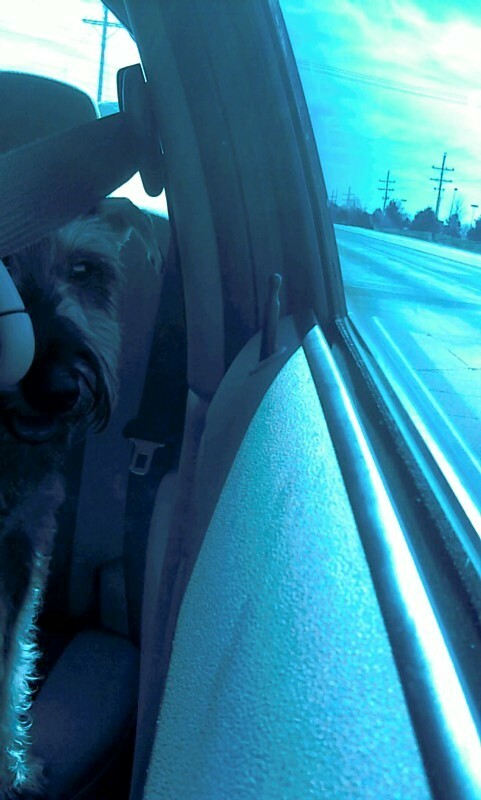 12:35 – Wally vomits all over backseat. (Perhaps again his passive-aggressive tendencies) Amanda cries inside. 12:36 – Amanda and Wally arrive at home only for Amanda to realize she has mud and dog blood all over her white shirt. She is immensely ashamed of herself and curious as to where the blood came from. 12:37 – Wally goes inside house while Amanda uses an entire roll of paper towels to remove vomit from her nice clean car. Needless to say it was pretty scarring event for both of us. Mostly me as the dog scratched the beejezus out of me in the car. I was the person with the crying baby on an airplane, only it was the annoying dog in the vet’s office.